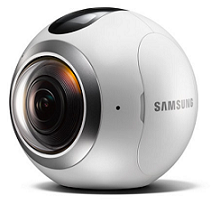 360-degree cameras are the new big things in the world of making memories. With big social media platforms, such as Facebook and YouTube, supporting 360-degree content, you shouldn’t be left outside this new revolution. Creating this type of content is easy – all you need is a good 360-degree camera. The following cameras are the best 360-degree cameras you can find on the market right now. 360fly 4K has not been on the market very long. Nonetheless, it’s a superb quality camera you might want to consider. The camera comes with a 240-degree fish-eye lens, which means that you don’t need to perform any content stitching when using the camera. The best part about the camera is the huge built-in memory. You get 64GB with 360fly 4K. It can also be controlled via a smartphone app that you can download online. With a good smartphone, this camera will create crisp 360-degree footage with an impressive resolution of 2,880 by 2,880 pixels. For those that want to really push the boundaries of 360-degree content, the Samsung Gear 360 is a must-have product to buy. 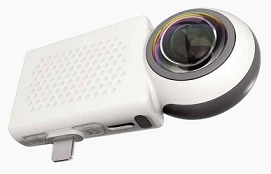 The camera comes with expandable memory, Wi-Fi, NFC and Bluetooth connectivity, as well as the ability to capture high-resolution content. You can take 30MP images and the duo 15MP sensors with fish-eye lenses guarantee high quality in photos and video. However, you do need to have a Samsung smartphone to use the product. You also want one of the latest Samsung phones, not the old ones. It’s still a good bargain for those that have a suitable phone. LG’s 360-degree camera is an all-around good product with an affordable price tag. You can use with most of the today’s smartphones and enjoy a 2K video as a result of filming. The camera also comes with expandable memory and the compact design makes carrying this camera around convenient. The LG 360 CAM comes with two 13MP sensors. It also has 200-degree lenses, which ensure good quality video. It’s easy to use and it makes filming a lot of fun. The Giroptic iO is a handy 360-degree camera to buy because it can directly connect to your smartphone. You don’t have to worry about carrying a big, bulky thing around you or waiting to get home to see the results. Indeed, you could use it for livestreaming 360-degree content! However, you will need to own an iPhone and have an iPad-friendly Lighting connector. You could also connect it with a USB-C or micro USB connector. With the camera, you can capture 2K video and it even allows you to take 4k photos. Another iPhone-only 360-degree camera is the Insta360 Nano. This is a beautiful attachment to your smartphone and it makes capturing 360-degree content intuitive and fun. The 210-degree fish-eye lens allows 3,040 by 1,520 pixels filming and you can do it with 30fps. One of the coolest aspects is the free app that allows you to use the camera, but to also enjoy your content with a VR headset. 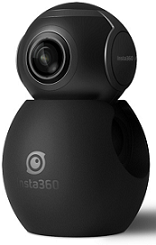 In terms of affordability, Insta360 Air would be a good pick however, it is only a little over budget. The 360-degree camera is your answer to the Giroptic iO if you don’t have an iPhone. It works best with latest Android smartphones by connecting via a USB-C connection. The product is super lightweight, although a little bulky. You can capture 2K video, as well as take 3K photos. 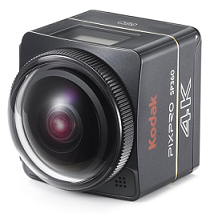 Another pricey, but a superb product to consider is the Kodak PIXPRO SP360 4K camera. It has a built-in splash-proof system and you can record UHD content with ease. The 235-degree lens is ultra wide and captures crisp and clear images. It’s a sturdy product that doesn’t mind a few pumps. When you purchase the camera, you also receive a mobile app and stitching software for ensuring your content looks smooth. If you want, you could potentially pair two of these cameras together for a fully spherical content capture. 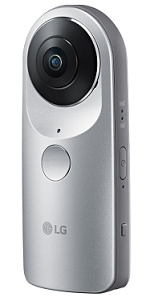 Finally, if you want a standalone 360-camera, Ricoh Theta SC is a good option. 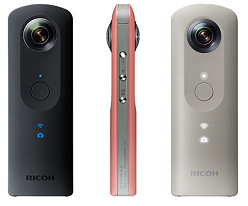 The sleek and slim product can capture 1080p video and take 14MP spherical images. The camera has its own smartphone app, which makes it easy to control. As a quirky feature, you can buy this 360-degree camera in multiple different colors. 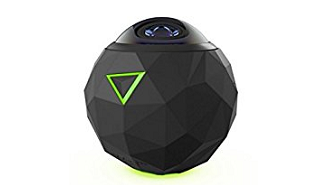 If you like to capture the things around you and share them with the world – or just enjoy them again yourself – 360-degree cameras are a must-have. The above collection should hopefully provide you with the best options on the market. If you are going a little over budget use coupons available on Frugaa.com to grab huge discounts. This will help you potentially push the price lower – you should consider the coupons when shopping for any camera on the list. So, pick your favorite and start capturing!